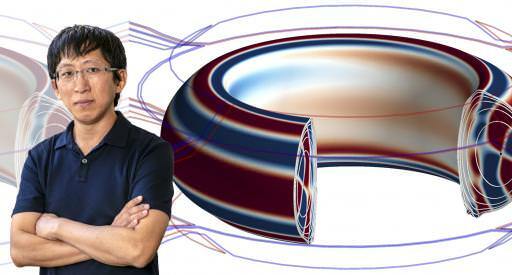 |SOURCE| A long-time puzzle in the effort to capture the power of fusion on Earth is how to lessen or eliminate a common instability that occurs in the plasma called edge localized modes (ELMs). Just as the sun releases enormous bursts of energy in the form of solar flares, so flare-like bursts of ELMs can slam into the walls of doughnut-shaped tokamaks that house fusion reactions, potentially damaging the walls of the reactor. To control these bursts, scientists disturb the plasma with small magnetic ripples called resonant magnetic perturbations (RMPs) that distort the smooth, doughnut shape of the plasma — releasing excess pressure that lessens or prevents ELMs from occurring. The hard part is producing just the right amount of this 3D distortion to eliminate the ELMs without triggering other instabilities and releasing too much energy that, in the worst case, can lead to a major disruption that terminates the plasma. Making the task exceptionally difficult is the fact that a virtually limitless number of magnetic distortions can be applied to the plasma, causing finding precisely the right kind of distortion to be an extraordinary challenge. But no longer. Physicist Jong-Kyu Park of the U.S. Department of Energy’s (DOE) Princeton Plasma Physics Laboratory (PPPL), working with a team of collaborators from the United States and the National Fusion Research Institute (NFRI) in Korea, have successfully predicted the entire set of beneficial 3D distortions for controlling ELMs without creating more problems. Researchers validated these predictions on the Korean Superconducting Tokamak Advanced Research (KSTAR) facility, one of the world's most advanced superconducting tokamaks, located in Daejeon, South Korea. KSTAR was ideal for testing the predictions because of its advanced magnet controls for generating precise distortions in the near-perfect, doughnut-shaped symmetry of the plasma. Identifying the most beneficial distortions, which amount to less than one percent of all the possible distortions that could be produced inside KSTAR, would have been virtually impossible without the predictive model developed by the research team. The result was a precedent-setting achievement. “We show for the first time the full 3D field operating window in a tokamak to suppress ELMs without stirring up core instabilities or excessively degrading confinement,” said Park, whose paper — written with 14 coauthors from the United States and South Korea — is published in Nature Physics. “For a long time we thought it would be too computationally difficult to identify all beneficial symmetry-breaking fields, but our work now demonstrates a simple procedure to identify the set of all such configurations." Researchers reduced the complexity of the calculations when they realized that the number of ways the plasma can distort is actually far fewer than the range of possible 3D fields that can be applied to the plasma. By working backwards, from distortions to 3D fields, the authors calculated the most effective fields for eliminating ELMs. The KSTAR experiments confirmed the predictions with remarkable accuracy. Korean work on this project was sponsored by NFRI in Daejeon, South Korea. NFRI is the leading institute for fusion energy research in Korea, and is devoted to developing the scientific and engineering basis for the realization of fusion energy. NFRI operates KSTAR under the Korean Ministry of Science and the information and communications technology (ICT) industry. KSTAR, one of the world's leading superconducting tokamaks, aims to achieve high-performance steady-state operation employing high precision magnetic systems together with production of 3D fields, advanced imaging and other capabilities critical for the success of this work. For more information on KSTAR, please visit http://kstar.nfri.re.kr. This research is supported by the DOE Office of Science and by support from the Korean Ministry of Science and ICT for the KSTAR project. PPPL, on Princeton University's Forrestal Campus in Plainsboro, N.J., is devoted to creating new knowledge about the physics of plasmas — ultra-hot, charged gases — and to developing practical solutions for the creation of fusion energy. The Laboratory is managed by the University for the U.S. Department of Energy’s Office of Science, which is the largest single supporter of basic research in the physical sciences in the United States, and is working to address some of the most pressing challenges of our time. For more information, please visit science.energy.gov (link is external).